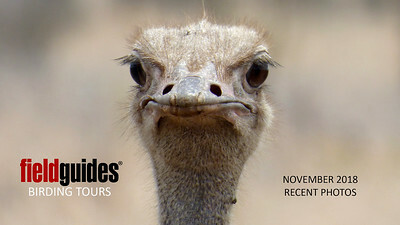 Our November Recent Photos Gallery begins with an intimidating stare from a Common Ostrich in this image by South Africa tour participant Cathy Douglas. Check out those eyelashes... Other tours highlighted this month include Safari Brazil, Southeast Brazil, Machu Picchu & Abra Malaga in Peru, Northwestern Argentina, Australia (Part One), Sri Lanka, Louisiana Rails, and Cape May. Enjoy! 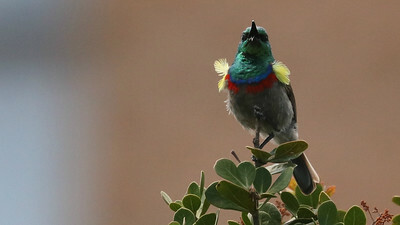 A brilliant Southern Double-collared Sunbird proclaims its territory on our recent South Africa tour. Photo by participant Kathleen John. 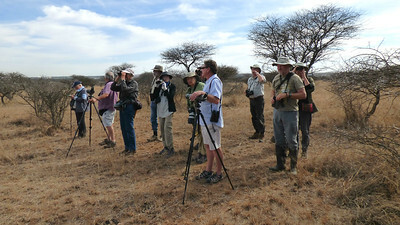 Here's our South Africa group with scope-wielding guides Terry Stevenson (l.) and Joe Grosel (r.) scanning and listening in Polokwane Nature Reserve. Photo by participant Cathy Douglas. 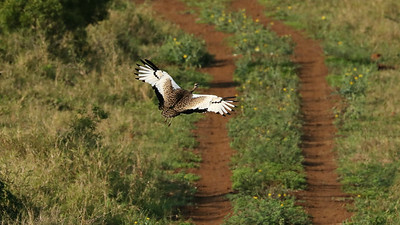 Cryptic on the ground, a Black-bellied Bustard becomes eye-catching in flight. Photo by participant Kathleen John. 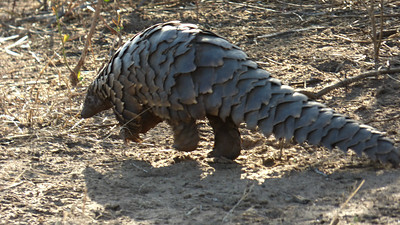 This amazing creature is a type of anteater called a Ground Pangolin. It was a lifer for guide Terry Stevenson, too, after 41 years in Africa! Sadly, the species' future is threatened due to illegal poaching. Photo by participant Cathy Douglas. 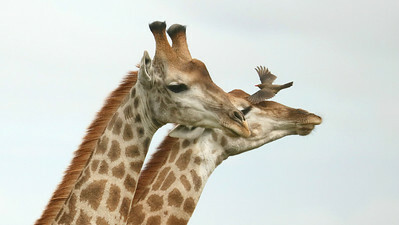 These giraffes seem to be lining up for the grooming services of this Red-billed Oxpecker. Photo by participant Kathleen John. 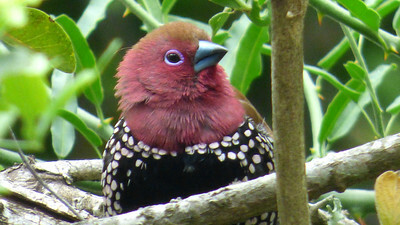 The wildly patterned Pink-throated Twinspot is in the Waxbill family. Photo by participant Cathy Douglas. 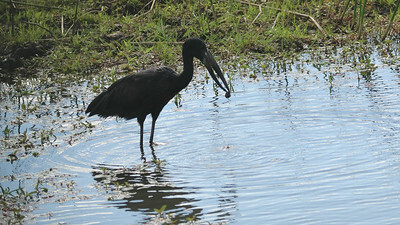 The beak of the African Openbill is highly evolved to specialize in the consumption of snails. Participant Kathleen John caught this individual in the act. 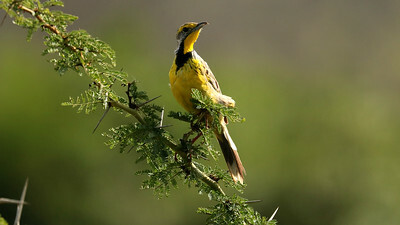 The hallux or hind toe of a Yellow-throated Longclaw is worthy of the name but shy of the length of the thorns on its perch. Photo by participant Kathleen John. 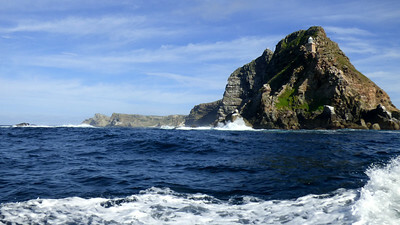 This dramatic seascape is Cape Point at Cape of Good Hope. Photo by participant Cathy Douglas. 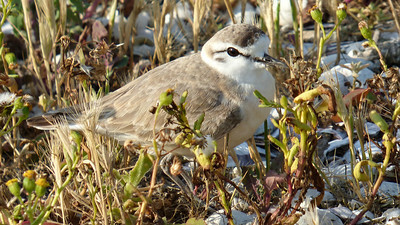 Participant Cathy Douglas shared this wonderful image of a White-fronted Plover. 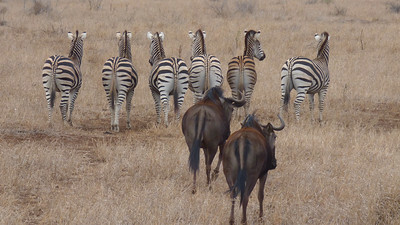 Since the Zebra and Wildebeest seem to be moving on, let's head to the next tour. Photo by participant Cathy Douglas. We begin this next series with a ratite or flightless bird, like the first set. 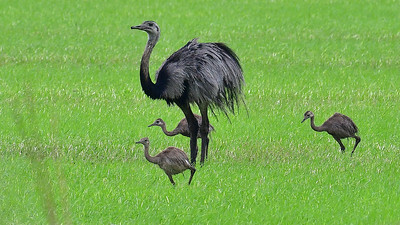 Here is a Greater Rhea with its young brood from our Safari Brazil: The Pantanal & More tour. Photo by participant Brian Stech. 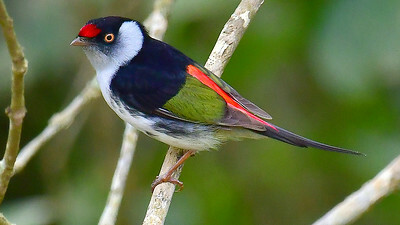 It may not have the bright overall hues of some of the other manakins, but the more subtle coloration of a male Pin-tailed Manakin is undeniably striking. Photo by participant Brian Stech. 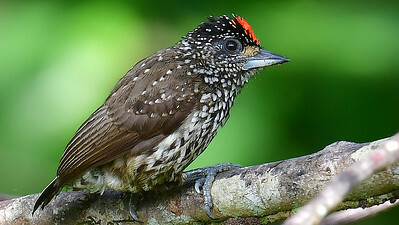 This White-wedged Piculet was most obliging. Photo by participant Brian Stech.